Most sport the Hello Kitty facade, but if you're (un)lucky(?) you might get one with Chococat, a somewhat depressed feline who joined Team Sanrio some years ago; My Melody, who I'm fairly sure is a bunny; or The Little Twin Stars, which I thought fell off the face of the earth in the early '90s. Sanrio characters will also appear in McWorld, where kids can interact with Hello Kitty or download screensavers, avatars and coloring sheets in her likeness. Requisite soundbyte: "Sanrio was built on the concept that small gifts can bring big smiles. 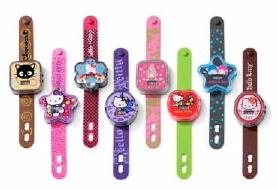 These watches are sure to bring smiles to McDonald's customers and SANRIO's young fans," gushed President Janet Hsu of Sanrio Global Consumer Products. Cradle to grave, baby. Cradle -- to -- grave. Are you kidding me? Hello Kitty has had Happy Meal toys forever. I even had a Hello Kitty-dressed-as-a-McD's-employee plush keychain in middle school. They came with certificates for a free huge pencil at any Sanrio store. There was also a pull-string "buzzing" bee and a pink diary with a ribbon for a lock. what is with all this false info??? this is MOST CERTAINLY NOT THE FIRST TIME FOR SANRIO IN HAPPY MEALS!!! !